Operation Husky, the Invasion of Sicily, was the first major Allied assault on German occupied Europe. 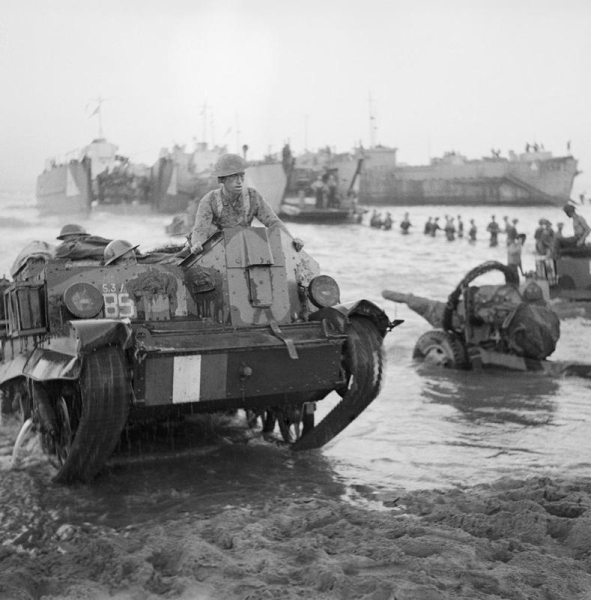 Churchill described Sicily and Italy as the soft underbelly of Europe but the Italy campaign was hard fought and only came to an end in May 1945. With the successful North Africa Operation Torch landings behind them and the gradual clearance of Axis forces from Tunisia underway, resources were becoming available for fresh amphibious landings in the Mediterranean. The Allies were still not strong enough to embark upon the ambitious "Round Up" invasion of Normandy, so the next phase of operations aimed to tie down Axis forces to relieve pressure on the Russian front in the east and to force Italy out of the war. This strategy was agreed at the Casablanca conference of January 1943 although, for a while, the Americans were inclined towards increasing pressure in the Pacific with direct attacks on Germany itself at a later stage. Plans were prepared to invade what Churchill called the 'soft underbelly of Europe' via Sicily. General Guzzoni had 12 divisions comprising two German and 10 Italian to defend the island, five of the latter were infantry and five immobile coastal defence divisions. The garrison was 350,000 strong but included only 35,000 Germans, who were not fully mobilised. Beach defences, including pillboxes and barbed wire, were less formidable than those encountered in Normandy the following year and modern tanks were relatively few in number, however, the rugged rolling countryside, favoured the defenders. The Allied Commander was General Eisenhower supported by Sea Forces Commander, Admiral Cunningham. General Alexander was Land Forces Commander and Air Marshal Tedder, Air Forces Commander. The original Allied plan envisaged two widely separate landings in the north west and south east of the island. General Montgomery objected, because this approach lost the advantages of a combined, closely coordinated force. In the final plan, the British 8th Army would land on the south east of the island and the US 7th Army in the south west. 2,760 ships and major landing craft from the River Clyde in Scotland, Norfolk, Virginia in the USA and from ports from Beirut to Algiers in the Mediterranean, converged on their rendezvous near Malta. They totalled seven and a half Divisions together with their equipment and supplies. The operation was the most meticulously planned to date and benefited from the experiences gained at Dieppe (Jubilee), North Africa (Torch) and other raids and landings. 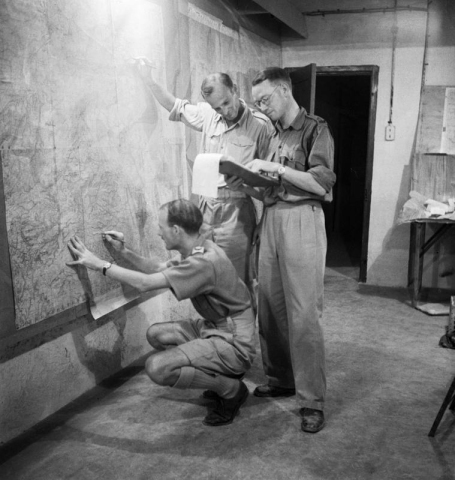 However, the Commanders in Chief, notably Cunningham and Tedder, failed to set up a joint HQ to co-ordinate all land, sea and air elements, which would have delivered all the advantages of speedy and effective communications in the heat of battle. Senior officers were scattered around the Mediterranean from Malta to Bizerta. Had any unexpected event arisen that required a swift response at the highest level, damaging delays and confusion might have arisen. In the event, the operation went well. Eisenhower and Mountbatten, who were in Malta, received confirmation that the landing had started from a BBC news bulletin! Force A, ex force W, was under the command of Rear Admiral Troutbridge on the Bulolo. The force comprised Dempsey's 13th Corps, 5th & 50th Divisions, which were to land between Syracuse and Avola on the south east coast. Force B, was under the command of Rear Admiral McGrigor on the Largs. 231 Independent Brigade was 15 miles to the south at Marzamemi and Sir Oliver Leese's 30th Corps, including the 51st Highland Division, were allotted the southernmost tip of the island south west of Cape Passero. Further west and north, between Scicli and Licata, with the strategically important airfield at Gela between them, were Divisions of the US 7th Army and US 11 Corps. They were to land on three beaches "Cent," "Dime" and "Joss" with a division allotted to each, plus an armoured brigade for "Joss." The remainder of the Armoured Division, to which it belonged, was kept afloat as a reserve. The American Operation was under the command of Lieutenant-General Patton and Vice-Admiral Hewitt. In addition, a number of special operations were in place. The first was No 3 Commando and the South African Squadron of the SAS to the extreme right near Syracuse. The second involved Nos 40 and 41 Royal Marine Commando, under Laycock, to the left of the Canadians near Pachino. The third involved a number of airborne landings, both British and American, to speed up the capture of airfields. There were potential conflicts of interest between the services in the timing of the operation. One such, concerned the parachutists who needed bright moonlight conditions to land safely. However, it was precisely these conditions that left the ships lying off shore most vulnerable to air attack. The matter was resolved in favour of the parachutists, since the Allies had air superiority which would deter the enemy. An Allied deception plan convinced the Germans that Greece or Sardinia were the most likely targets for the invasion, so the Commander in Chief of the Luftflotte 2, concentrated his resources on the defence of the latter. Pantelleria and Lampedusa had already surrendered in mid June, after intense, sustained aerial bombing by the Allies and the bombing of Sicilian Airfields in the 7 days prior to Husky. This had been so successful that not a single Axis plane harassed convoys approaching Sicily. In the afternoon of D-1, an unseasonable, force 7 north-westerly gale blew up, causing the smaller craft in the invasion fleet to toss about like corks. On D Day itself, the Canadians and Americans landed in very rough conditions, suffering the double discomfort of seasickness and a drenching through to the skin. 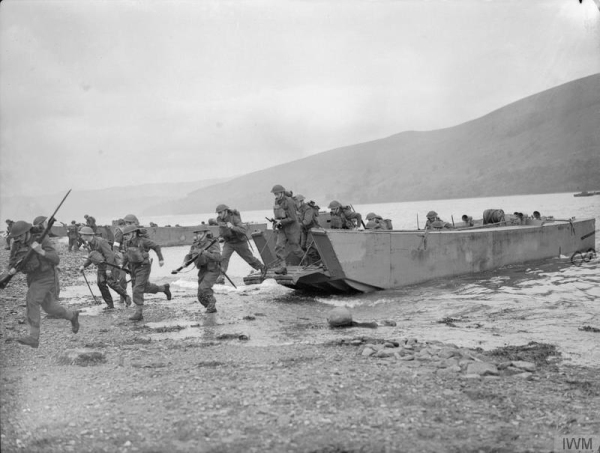 The conditions on the leeward side of the island were better, as the landing craft moved inshore. However, these generally unfavourable conditions caused the enemy to relax their guard in the mistaken belief that a landing in such conditions was most unlikely. Initial resistance was, consequently, less than expected. The high winds caused problems in the air too but, this time, with dire consequences for British and American troops being flown from Kairouan in Tunisia to Sicily in 137 gliders and 400 transport aircraft respectively. Due to poor flying and navigational conditions, combined with inadequately trained pilots, the planes and gliders were badly scattered. Only a fraction of the elite troops reached their targets but in sufficient numbers to complete their assigned tasks. Of the gliders in the British sector, about a dozen were released early and were lost in the sea, with many casualties. To compound the self inflicted air losses on or around D + 3, a number of Allied supply aircraft were shot down by friendly fire, as they strayed over the battleground. The aircraft were certainly off their approved course but the primary cause was a failure in aircraft recognition by the spotters and gunners on the ground. There was also concern over the disappearance of 9 of the 13 officers and ratings who reconnoitred the landing beaches prior to the Operation Husky. They were part of a small elite force that gloried in the deceptive name of Combined Operations Pilotage Parties (COPPs). Their task was to provide vital intelligence about tidal and beach conditions, to ensure the landing beaches were suitable for heavy vehicles etc. Their work was undertaken in darkness to avoid detection. If they, or their clandestine activities, were discovered, their presence would give advance warning of an impending operation, giving the enemy time to regroup and be reinforced. However, because Sicily was an obvious target, feints and deceptions were deployed consistent with a planned invasion in the Balkans. These included attaching Greek interpreters to battalions. These and other deceptions gave the Allies the surprise needed. When the scale of the invasion of Sicily became clear to Hitler, he immediately cancelled a planned offensive at Kursk on the Russian front and ordered the transfer of troops to the defence of Sicily. Below is a diary of events in support of the British Eighth Army, by an unknown author. It was kindly provided by Howard Wallace-Sims, whose father served in Combined Operations in WW2. 02.35 All's well. Beach lit up by star shells. AA fire. Waiting to go in. First wave of RM Commandos in LCG3 believed gone in. 02.45 Our wave ready to go in, LCGs 9 & 10 with Canadians. LCG3 just going in. RAF still carrying out softening process. 04.30 Prepare to fore on machine gun posts from which tracers are pouring. Range 1000 yards. Dawn is now breaking. Troops still pouring in. 08.00 No further developments. Expecting enemy naval forces. We are now lying 800 yards of landing beach, 200 yards off rocky point. Water is only 25 feet deep, too shallow for LCIs to beach. Troops being taken ashore in LCAs. Just said hello to some pals in an LCA passing on the starboard quarter. It’s a small world. 51st Division still pouring in. More troop ships than that standing by, out to sea. Monitors and Destroyers which took part in shelling from further out, standing by, also awaiting orders from Admiralty. On the south-east side of the island, Syracuse fell on July 10 and Augusta on the 13th, both to the advancing British 8th Army and the XII Corp which was advancing on Catania. On July 13, the leading troops were held up by an enemy rearguard at Lentini. To speed up the advance, landings were made to capture the bridges to the north of the town. No 3 Commando landed at Agnone and prevented the destruction of the Ponte del Malati, while the 1st Parachute Brigade and 151 Brigade, captured the Primasole Bridge over the Simeto. This gave the British forces a route to the plain of Catania. Because of resistance from the Hermann Goring Division, these gains were made at considerable cost. The Germans were firmly established on the slopes of Mount Etna, which held up the British advance. The plain, with the Gerbini airfields, was in dispute for almost three weeks. On the south-west side of the island, the only serious opposition encountered by the Americans was at Gela, when the 1st US Division and a tank battalion were, after an unimpeded landing, met with a counter attack by German troops and armour. By D + 2, the invaders were back on the beaches. At one stage, German tanks broke through the bridgehead but were engaged by the cruiser Savannah and the destroyer Shubrick. Order was restored as their 30 six inch guns bore down on the Germans from point blank range. 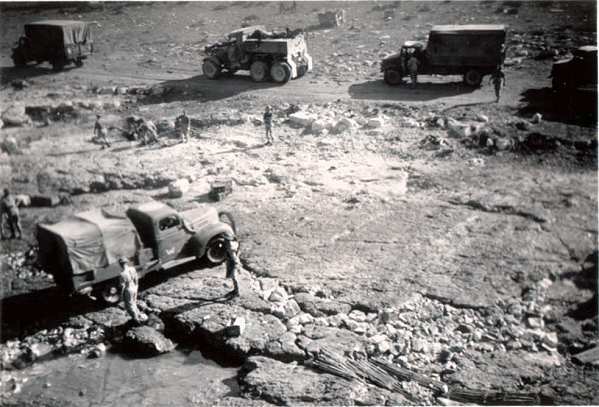 This temporary German success was attributed, in part, to delays caused by the swell but also to General Patton's eagerness to push inland before the required supporting arms were in place. The troops soon came up against the formidable 15th Panzer Division in full array. Without the naval intervention, there was a serious risk of the US forces being pushed back into the sea. Patton was obliged to move back on board Hewitt's HQ ship. Later Mountbatten, in all innocence, enquired by loud hailer from his destroyer to Hewitt "How far has General Patton got?" Hewitt replied "He has not! The General is back on board this ship." History does not record Patton's words when he and Mountbatten met shortly afterwards. The Canadians near Pachino had, at their disposal, the newly introduced Landing Craft Gun (LCG). One lucky round from them blew up an ammunition dump but, more generally, the effectiveness of the weapon would have been improved had radio communications between the advancing troops and the LCGs been better. Six Landing Craft Tanks (Rocket) were in support of the Highland Division and they performed superbly under the command of Lieut-Commander Hugh Mulleneux. Each of the 2,500 rockets fired, as the "Jocks" approached the beaches, delivered a punch 25% greater than that delivered by a 6-inch shell. The Highland Division landed with only a handful of casualties. On July 22, the Americans under General Patton entered Palermo but, by the end of July, their advance was slowing down as they approached Mount Etna. However, when German resistance at Adrano was overcome on Aug 6 by the British 78th Division and the capture of Randazzo on the 13th by US forces, the German position was no longer viable. The beach organisation was better than 'Torch' but there were still problems caused, mainly by human error. One example was the misuse of the miraculous DUKW, a 2.5 ton American amphibious lorry. Those carrying troops should have deposited them on or near to the landing beaches but chose to deliver their human cargo close to the front line. The congestion in the narrow Sicilian streets and roads was chaotic, at a time when the movement of supplies and weapons was a priority. One DUKW was loaded with 10 tons of ammunition, when the limit was a quarter of this. To the considerable consternation of the driver, his DUKW disappeared below the waves as he left the ramp! Improved waterproofing of vehicles and recovery measures for stranded or broken down craft, reduced losses to as little as 1.5% on the British beaches. On the more exposed western beaches, losses were around 12%. The small harbour of Licata had a greater ship handling capacity than thought and this relieved pressure on supplies and communications, as well as reducing dependence on Syracuse and Augusta. Human errors of judgement in the management and control of men and materials, through the landing beaches, caused delays and loss of effectiveness. This unenviable and arduous job was that of Beachmaster. There was critical comment from senior staff about the selection criteria, recruitment and authority of the post holder. However, by the time of the Normandy landings, they had gained in respect and authority. One beachmaster is reputed to have ordered a general to "Get off my bloody beach!" "Beachmasters and assistant beachmasters should be men of personality, experience and adequate seniority, capable of exercising complete control in the dark." (McGrigor). "Naval Beachmasters should be preferably bad tempered and certainly dictatorial by nature." (Henriques). "The Brick (Beach) Commander must be King of the Brick (Beach) area" (Maund). "Some of the American Beachmasters are too junior and too polite to Generals." (General Wedemeyer of Eisenhower's staff). There were abuses in the deployment of men and materials. One divisional commander re-deployed men engaged on shifting supplies. Within 12 hours, they were on the front line. He later complained about delays in supplies reaching the front lines! Too many senior officers, who should have known better, regarded the Beach Groups as a "God-sent pool of everything." Later reports from different sources criticised this phase of the operation. The Americans had a standard operating procedure (SOP) for the landing of men and materials. This required all the men and materials for the first battalion to go ashore, to be carried on one ship. However, there was no ship capable of carrying all the landing craft needed, so other landing craft were drafted in from nearby ships. This arrangement required a high degree of training and complete immunity from enemy interference. Potentially, as landing craft moved around in the dark, going from one vessel to another, some might get lost and others delayed. Henriques put his concerns to Patton, who seriously considered adopting the British technique but decided that it was too near the operational date to make last-minute changes. In the event, thorough rehearsals by the Americans and the lack of opposition from the enemy, enabled the system to work. planning in minute detail which engendered sufficient confidence to confront unforeseen problems with flexibility. Henriques was also very impressed with US Navy crews. "Their coolness and discipline were quite outstanding and could never be forgotten by any of the soldiers taking part in the operation." Other lessons were learned from the Americans. Whereas the British basic beach group unit was an infantry battalion, the Americans had an Engineer Shore Unit with a high proportion of technically qualified men. Such skills were invaluable in quickly resolving unforeseen problems in the area of the beachhead. 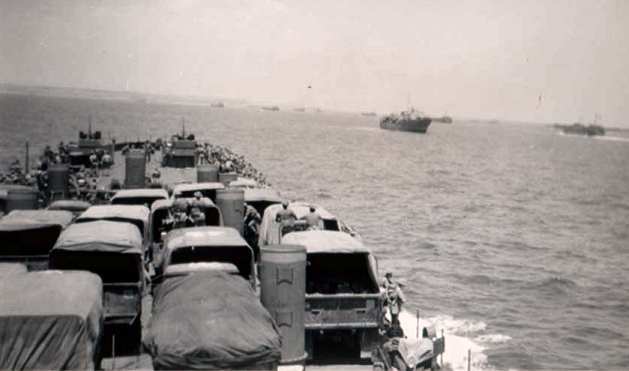 In addition, the Americans had an efficient and effective method of loading store ships, with groups of stores secured together for loading into DUKWs for easier dispatch to the shore. 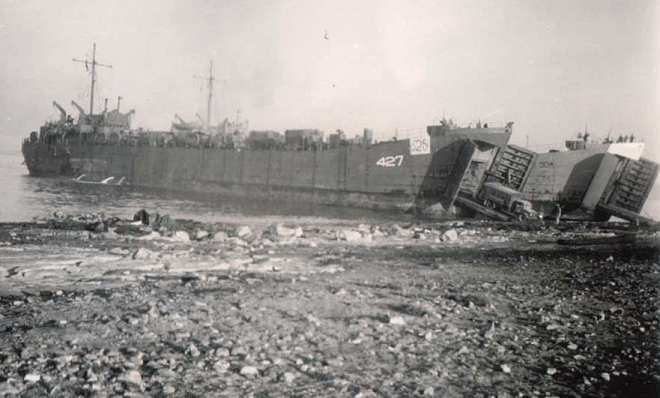 HM LST 427 served in the Mediterranean from June 1943 to early 1944 as part of the 3rd LST(2) Flotilla under the command of Flotilla Officer Acting Commander D S Hore-Lacey RN. Her sister ships of the 3rd LST Flotilla at that time were 322, 324, 367, 410, 412, 417, 419, 420, 423, 426, 428 and 430. Acting Commander Hore-Lacey, took passage aboard the LST 322 making her 'Leader' of the flotilla. The photographs below were taken by Temporary Acting Lieutenant Commander W G E Rawlinson RNVR, who commanded LST 427 during the period 1943/45. 427 was built by the Bethlehem Fairfield Company, Maryland, US, launched on 19/12/42 and commissioned in the Royal Navy on 16/2/43. She departed New York for the Mediterranean on 28/4/43, ultimately taking part in the landings in Sicily, Salerno, Anzio, Normandy and Malaya. Left to right; 1) Elements of the British 8th Army aboard 427 at Sousse. 2) D-Day. 427 and other landing craft 'stand in' to Bark South beach. 3) 427 discharging mechanised transports. Portside is HM LST 304 of the 1st Flotilla. 4) D-Day. British LST's on the beach... identity of the craft is uncertain. 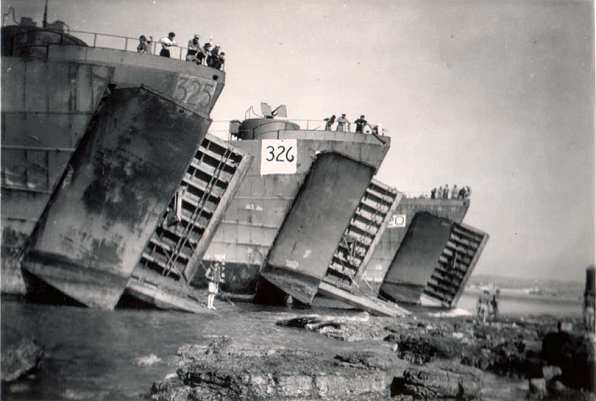 The numbers 325 and 326 on the bows would appear to be army serial numbers, or loading numbers, brought into play at the point of embarkation. It is also the number by which the craft would have been called to the beach to deliver her payload. 5) D-Day+1. Bark South beach, view from the bows of 427. 6) D-Day+1. 427 on Bark South beach. Husky was a great triumph and Mountbatten could not disguise his delight at the important part Combined Operations had played in the operation. For his part, Hewitt's report included 178 recommendations and ended with the warmest praise for the co-operation and comradeship between the Royal Navy and that of the USA. He recalled that it was barely 14 months since he had visited Admiral King's office in Washington. 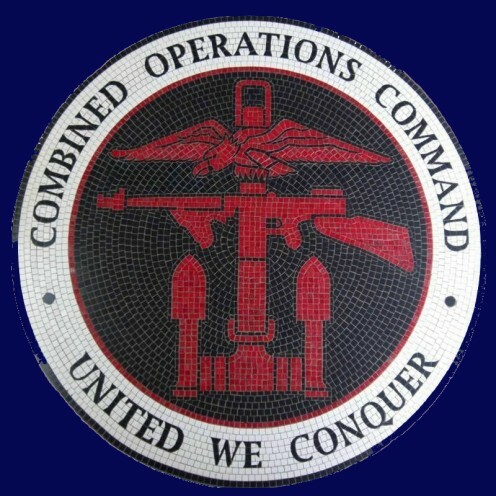 They and their respective teams had shared much in the planning of the operation and the rewards were there for all to see. "I accompanied Admiral Ramsay on board the Antwerp on D minus 1, and saw all the convoys as they passed on their way to their rendezvous south of Malta. I have been 27 years at sea and I have never seen a sight like it in my life. It was like the Spithead Review multiplied by twenty. There were just forests of masts in every direction, as far as the eye could see. It was the most imposing and inspiring site and all troops and sailors had their tails so obviously vertical that, when you went anywhere near them, they broke into cheers." Axis Forces: Air - Varied units of German and Italian Air forces. Sea - Varied units of German and Italian navies. Land - Two German Divisions (later reinforced by Eastern front troops) and Ten Italian Divisions. Outcome (positive): Allied victory. With the capture of Sicily the Allies made ready for the invasion of Italy. 37,000 German and 130,000 Italian losses mostly prisoners. Gain of naval and air bases in the Mediterranean. Outcome (negative): 31,158 killed, wounded or missing. Italian Star Veterans 1943 - 1944 website and memorial appeal. Click here. Sicily Landing Siracusa - Impavidus Cultural Association. As president of the Association I would like to invite your readers to visit our website to find out about our Association. Veterans of the landings, who would like to join us, are particularly welcome - there is a page on the website to register your interest. For further information contact tour.impavidus@gmail.com. Commando by Dunford-Slater. Pub. by Kimber 1953 - from the pen of one of the major players. The Watery Maze by Bernard Fergusson pub. 1961 by Collins. Please let us know if you have any information or book recommendations to add to this page. My name is Peter Lankester, MBE, of Bexhill-on-sea, East Sussex. I've just by chance come across your website which, as a WW2 Combined Operations veteran, I found interesting. 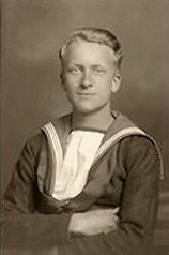 I volunteered for the Royal Navy when I was seventeen and a half in 1942. I commenced my seamanship training at HMS Collingwood in October that year followed by Combined Ops training at Hayling Island in Chichester Harbour, immediately to the east of Portsmouth Harbour. I believe it was a partly built Warner holiday camp and my billet was in the builders' hut with no heating... and it was February!! Whilst there, we were instructed in buoys and buoyage, the 'rule of the road' at sea and we used a mock-up of an LCA cockpit as an introduction to being a Cox’n. We were only there a short period when we moved to Saint Osyth on the Essex coast between Clacton and Brightlingsea. We used the nearby Martello Tower to practice pistol shooting and some beach huts on the sea wall served as our home, again with no heating. We lived in these timber framed, asbestos clad structures for about a month while we formed into the 143 LCM (Landing Craft Mechanised) Flotilla. By then, a certain amount of 'weeding out' had taken place and some of the trainees went elsewhere while, in our training group, twelve of us were selected as Cox’ns. By then the Flotilla comprised over 100 men. We commenced our training on a whole variety of craft including LCAs, LCPs, British LCMs, LCVPs, etc. We used the hulk of the Cutty Sark, anchored in the River Blackwater, for our training in coming alongside. We were joined by stokers, mechanics, signalmen, ERAs and other officers when we arrived at our next destination, HMS Roseneath, Gareloch in the Clyde estuary, Scotland. With a full complement we undertook further training on British LCMs until we took delivery of new LCMs from the US. After familiarisation training, we boarded the converted train ferry, the Royal Daffodil, bound for Liverpool, where we stayed for a time until the Flotilla was dispersed amongst three liberty ships, each with four craft lashed atop the holds. Living accommodation had been built between the decks on the Ocean Wanderer (my Liberty Ship) and we were fed from the ship's galley. We eventually joined a convoy which was repeatedly attacked on its voyage to North Africa. Several ships were sunk on the voyage and we joined the DEMS' (Defensively Equipped Merchant Ships) gunners on watches and actions against the enemy. My ship was equipped with the AND (Admiralty Net Device), a heavy hawser net on booms trailed on paravanes a short distance away over each side of the ship to protect against incoming Torpedoes. We eventually slipped through the Straits of Gibraltar in the dead of night and made our way to Algiers where we temporarily disembarked our craft and unloaded all the vehicles and stores in the port of Algiers where we were moored close to the Battleship Arkansas and the British Submarine Depot ship Maidstone. They were subsequently reloaded in preparation for the landings in Pantelleria and Sicily but, in the case of the former, were not needed as the enemy surrendered and the island was occupied peacefully. We then moved with destroyer protection westward to Bizerta, accompanied by many other ships and anchored in Lake Bizerta. There, we waited for the departure of the convoy we were to join for the landings on Sicily, codenamed Operation Husky. Our beaches were near Avola in the Gulf of Noto. We arrived after D Day and spent some time taking supplies and equipment ashore from our ship and many other ships. 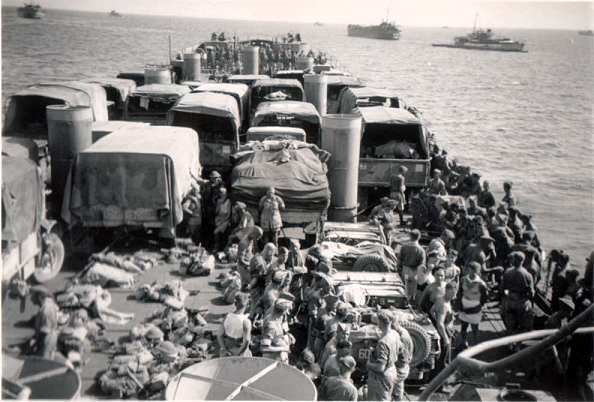 We had pontoons anchored at the beaches which had been towed by tugs from Malta. They were really experimental but the experience gained was no doubt fed into the development of the Mulberry Harbours. Bombing of the beachhead took place most nights but splicing the mainbrace ( taking a tot of Navy rum) every evening, helped us cope. 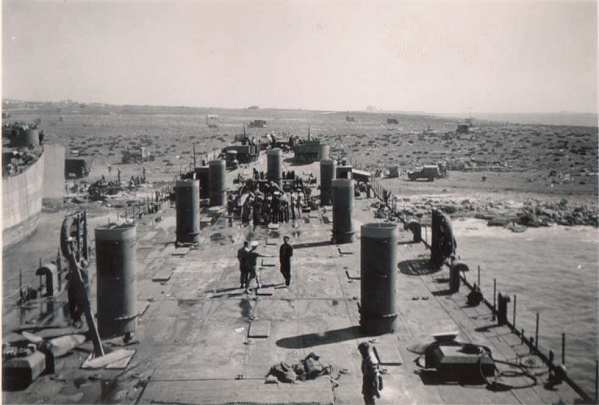 We then moved up to Port Augusta where we repaired and tidied up our craft in preparation for the landings on mainland Italy on 3rd September 1943, codenamed 'Operation Baytown'. 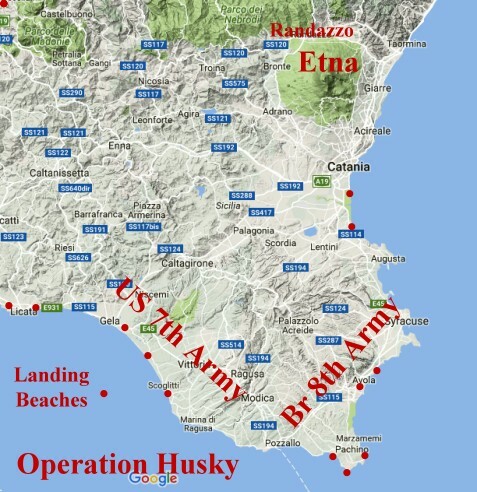 After the landing, we set up our base and HQ behind the beach near Reggio Calabria and spent twelve and more hours a day, during the next few weeks, transporting Eighth Army equipment, transport and stores across the Messina Straits from Messina to a beach near Reggio Calabria. Eventually, we were withdrawn aboard the Princess Beatrice LSI. Unfortunately, I contracted pleurisy so was out of action for some time. The Flotilla then joined HMS Hamilcar at Djedjelli in Algeria (the main Combined Ops base in Western Mediterranean) where we lived for many months in the Army's '160 pounder tents' we carried on our LCMs. Our craft were hauled out of the water on cradles and slipways so we could carry out repairs and maintenance on them. Around this time, our flotilla numeric was changed to 665 and I became a Leading Seaman Cox'n. Whilst there, we were visited by Lord Louis Mountbatten. We left HMS Hamilcar aboard HM dock ship, Eastway, in 1944. At the time of the occupation at Taranto in Italy we stayed in the accommodation ship Vienna, with our craft tied alongside. We were then seconded to the Third American Amphibious Force in preparation for the invasion of the South of France, codenamed Operating Dragoon. I spent some time in the RN sick quarters of HMS Fabius in Taranto suffering from malaria but was able to rejoin the flotilla just before it took part in Operation Dragoon. We landed at Cavalier Bay west of San Tropez where elements of the Free French and French Colonials, from places like Chad, disembarked. We then moved west to Port de Bouc to assist with the disembarkation of transports as the German's had destroyed port facilities. After many weeks, we moved east to Marseilles where we left our craft to be shipped to the Far East for operations there. We returned to HMS Hamilcar in Messina on LCl(L) 113 until we took passage to Malta on the surrendered Italian cruiser Ceaserea Africana. From there, we returned to the UK on the troop ship Empress of Scotland for another short spell at HMS Westcliff before myself and half the flotilla transferred to Dover Harbour for duties there. We had six LCPs to manage the harbour traffic of mainly LCTs operating between the UK and France. Around this time I left Combined Ops and went to a Corvette HMS Pevensey Castle as Leading Seaman of the Port watch. This took me to the West Africa Station, eventually returning to the UK and demobilisation in mid 1946. I trust this account is of interest and that there are not too many inaccuracies but it was all seventy or so years ago!! This account of Operation Husky, the invasion of Sicily, was compiled from information contained in the following books; Commandos 1940 - 1946 by Charles Messenger. Pub. by William Kimber, London 1985. 0 7183 0553 1, Commando by Dunford-Slater. Pub. by Kimber 1953 - from the pen of one of the major players. The Watery Maze by Bernard Fergusson pub. 1961 by Collins.